Navy and white, always a classic. 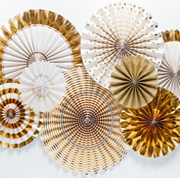 These gorgeous fans bring a bit of style to any party setting. Four seperate fans of different sizes.